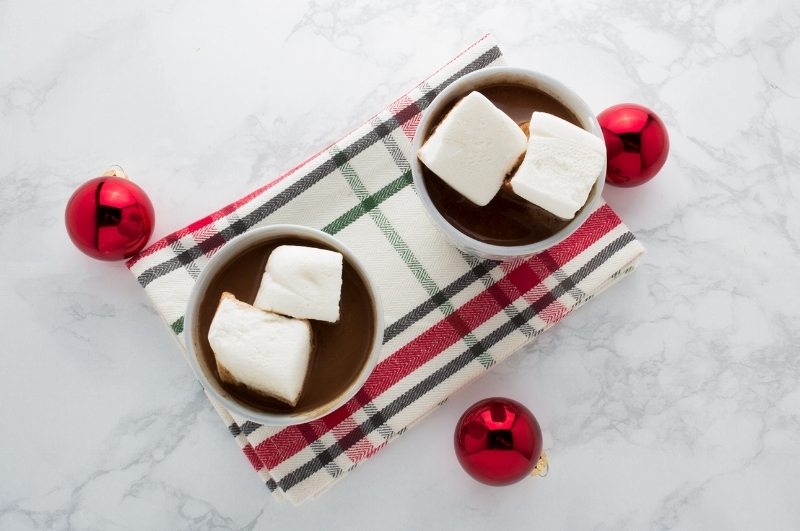 Silky smooth spiked hot chocolate is a perfect match to homemade marshmallows. Last week I shared my favorite holiday cocktail, the Classic Hot Toddy but I have to admit this Vanilla Cardamom & Bourbon Hot Chocolate is giving it a run for its money this year as my preferred festive drink. Our snow season here in New York this year has started early and that means I am craving warm, cozy food and drink even more. And what could be better on a snowy day than a big mug of spiked hot chocolate? Not much, if you ask me! Plus, this hot chocolate uses my healthier hot cocoa mix which means it's filled with nutrients from real raw cacao and only uses a bit of coconut sugar to make it sweet. While all sugars are broken down in the body in the same manner, coconut sugar does have a lower level of fructose compared to regular cane sugar which may be a health advantage. Personally, I like using it because it has a delicious, deep, caramel flavor. Pairing this hot chocolate with a bit of cardamom and vanilla provides a wonderful warming element to an already comforting drink and the bourbon just makes it extra special. Oh, and don't forget those homemade marshmallows! Seriously, these couldn't be easier to make and they last for up to 2-3 weeks in an airtight container. I love Wellness Mama's recipes that uses honey and real gelatin (I use Vital Protein's Gelatin which is made from pasture-raised & grass-fed beef). So next time the snow rolls in, pour yourself and a loved one a mug of this toasty cocktail and enjoy! 1. In a small saucepan, combine the milk, vanilla and cardamom pods and bring to a low simmer over medium-low heat. 2. Stir in the hot cocoa mix and whisk well to remove and lumps. Let simmer another minutes after it is fully combined. Remove the cardamom pods with a slotted spoon or strain through a fine mesh sieve if there are a lot of small pieces. 3. Pour 1.5 ounces of the bourbon into each of your mugs or glasses. Pour in the hot chocolate and stir well. 4. Top with marshmallows and enjoy!